My creative life lately has been filled with very practical things–like sewing up a gaping and quite revealing hole in my husband’s work-as in saturday outside, hard labor-pants, replacing buttons, and appliqued washcloths. Which obviously means that my sewing machine is working now. Thank you for all your suggestions. I did almost all of them, so I really have no idea what worked. But new bobbin, new needle, rethreaded, screws tightened, dust vacuumed…it’s working. But back to the washcloth….it’s a small part of Dan’s and my attempt to work through some bedtime battles. The girls share a room now, and the struggles have been escalating since Elizabeth was born. It’s call you in a million times, get all settled and tucked into bed then remember you have to go the bathroom, grumbling because your sister is talking, whining because your "tummy hurts", bad attitude, hyper-active, over-tired–you name it, we’re experiencing it at bedtime. When we first put them in the same room it was heaven. Dan and I would be dumb-struck, sitting in the living room waiting for the little voices to call out to us, but they never did. It was like they were so happy to be together, they didn’t need us anymore. I guess the charm has worn off. And really there’s nothing worse than ending your day with them with these struggles and anger and frustration, especially for Dan, who’s time with them when he gets home from work is already limited. SO, we’re making some changes around here. (how many times have I said that on this blog?) Starting with adopting my grandmother’s (mother of 15, granola recipe to follow) strict bedtime philosophy. Many times since we’ve lived here on the farm with her, I’ve heard her mention how they would call the children in from playing at 7:30, even in the summer when there was still plenty of light for playing, and all the other neighbor children were still awake and available. Granted, I don’t have quite so many children to get ready for bed but we’d been letting bedtime slip later and later this summer and the kids were so tired…ugh. it was just horrible. So we’ve established a "time to come in" time–a tiny bit later than my grandmother’s but still early by previous standards. And we’ve established a bedtime routine. It seems like a lot of steps, but really all those bathroom steps flow together. I mean, we’ve tried everything but a real routine, so I’m hoping this helps. And we took down their bunk beds until further notice. (It seems to help mary to be able to see emma. She doesn’t call us in as much.) And as I write this many of you are probably thinking, "Duh, molly, we all already have a bedtime routine, this is nothing new…", but I’m pretty sure we all still have a few bedtime battles that we fight each night. Ours has just grown quite a bit, lately. So what does this have to do with a washcloth? Well, the day I introduced the new routine, we sat at the kitchen table and drew little pictures of all the steps–I never thought I’d spend so much time trying to teach emma how to draw a toilet…and then I gave each of them their own appliqued washcloth to hang on the hooks by the sink. Just trying to drum up some enthusiasm for the new routine, you know?! It’s day three of "Project Bedtime Routine" and it seems to be helping. Things seem calmer at bedtime. And I do believe that children like a little routine and structure and regularity in their lives. I do, too. I’ll keep you posted on how this works. Parenting is contstant evaluation and adjusting, isn’t it?! So, this is really long. Thanks to those that stayed with me. I think I"ll save the recipe for Monday. If you’re desperate for it, let me know and I’ll email it to you. I just finished up my jar of it and want to make some this weekend, too. Hi – I’ve enjoyed your blog for sometime now. We have 2 kids – 5 & 7 and up until last yr they shared a room (boy/girl). I think having a routine and an early bedtime helps – at least it has worked for us. But we have continued pretty much the same routine since they were very small. Their bedtime is early (between 7 and 7:30) but they are up early and it works for us. When we have company or out visiting we are flexible – though if we are visiting for an extended period of time with relatives say – we do tend to try to keep the routine and early to bed within reason. routine is always good is my opinion. we have the summer slip going on here too and it has been lots of tears and yawns. back to stricter rules we go. we have a routine, too – and it’s quite early. i wanted to let my 7yo daughter out to play later this summer when all the kids are out, but guess what? the routine is so ingrained that she would rather stay in, get her pj’s on, read and call it a night. we have a good routine, very similar to yours, but it just starts a wee bit later in the summer. during the school year, the girls are in bed at 7:30, but they can read for a half hour. it works well for us. 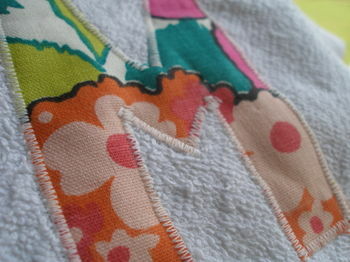 ps – that is one cute washcloth! Hey, if a monogrammed wash cloth is what it takes then by all means, applique away. We don’t have trouble at bedtime, it’s the after lunch but I’m too big for a nap trouble in our house. I need to think of something to sew for that. I love it when you write that you’re making changes… It always makes me feel like I’m not-so-much in left field with the constant reworking of my parenting game. I love it that you share your strategies and your “trying it outs” and that you make special washcloths to drum up enthusiasm. It’s fantastic. I think this is great– so many times around here, we do let things slip later, let kiddos get tired and cranky, and then nobody feels like extended grace to each other and everything is so much harder. Routines are wonderful in the security and care they give. This post makes me think that my four year old may need a bit more of this in his world. I understand all too well.Bedtimes creep later and later in the lighter months.It’s amazing how much this affects everything.I find it such a dilemma the chance to play outdoors and enjoy the light against the bedtime fights.If I’m honest playtime usually wins! Everyone has their bedtime troubles. I thought we had a really good routine with our Lily but recently it has gone pear shaped. My husband (who is soft) started to cuddle her after story and now she wants whoever is putting her to bed to cuddle her after story. Doesn’t sound like a problem? Her end of the cuddle is basically locking her little muscly arms around your neck and then crying for ages when you finally pry yourself loose!!! Arg! Molly, this is so perfect. We are going to start using this exact routine tonight!! The kids bedtime is always a struggle and even though we follow a very llose routine, I think one a little more step by step like this might work better. good thinking Molly- I am totally with you on the bedtime routine. i hate to be selfish with my time, but I am through around 8:30 as being mother…kids need to know your expectations and to follow through with them, you know? what will happen when they become adults?! i find that some routines are really helpful for my kids – it’s as though routine gives them a framework within which they can explore the world safely and freely; as though routine provides security in their sweet little lives. but i struggle, always, to find the place where there is just the right amount of routine so that their exploration of life isn’t stifled. and then, when the routine begins to slip (as it always does), they let me know and we have to hunker down in some way or another. i love how your washcloths are the “hook” for your routine. Ironically I’m reading this while listening to my toddler fuss, cry and whine herself to sleep 45 minutes after sleep time. Her near perfect routine has been disrupted by the introduction of the big girl bed (the crib is getting a new occupant shortly–my niece). Routines are great, I’m especially realizing that now. I need routing. Especially since we are contemplating a two kids in one room move soon. I’ll be referencing back soon. I have always so sucked at bed times. Sounds brilliant! Good luck… And you’re probably right – many of us have bedtime “routines”, but sometimes they need to be refined and made official again. We’ve always had a routine with our now 3 year old. Unfortunately it just gets LONGER and LONGER and new things somehow get added. From bath to bedtime takes about an hour and a half. If we try to skip a part of the routine because we stayed out late at a barbeque or something she simply won’t have it! If I’m lucky we’re done with bedtime by 9 on weeknights and 9:30 on weekends. With a newborn to care for as well it’s getting to be a little much! Then again, my husband gets home late and I need my kid to sleep late in the morning– I just can’t get up before 7, though I must, frequently. Luckily my kid still naps. So it’s all my choice, I guess! if i were a little girl off to bed, i would LOVE using that wash cloth. how cute! i don’t have children yet…but i’m taking mental notes for when i have little bunnies of my own. such good advice. good luck with the new routine…i’m sure the kids will do great! I love the idea of putting the bedstuff together after dinner before playing. That is the part that alwys trips us up- the transition from doing whatever to getting your bedstuff on. thank you for sharing this — wishing you many peaceful evenings ahead! OT, but I haven’t received the buttons and pendant I ordered from you yet. Any idea on when I should expect it? Hang in there, Molly, you’ll get back to your routine again! We have had the same struggles periodically and have to tighten the reigns a bit to get things back in line when we get too lazy about enforcing the rules. Someone told me once that sleeping, eating, and pottying will be the biggest issues in raising young kids b/c these are the only areas that they have most of the control of. Just about every single night of her life, my daughter has tested us at bedtime. There were many months that I cried every night from exhaustion thinking she would never go to bed easily!! Thank God the most difficult part did pass! And it will for you, too. Having a set of rules does help a lot. It is less personal in the sense that, this isn’t punishment, these are just the rules. I think kids get that better than we do 😉 Keep up the good work! Oh, and I’m definitely going to do the washcloth thing–brilliant!! We’re following the same kind of routine here..time wise but I LOVE the part where they put the pj’s on the bed after dinner adn then go play. We are doing this from tomorrow. Great idea. We ahve music on when the bathtime is happening..and DS#2 insists on Doris Day…but it works!